ANORAK is always interested in people who share the same name. Today we learn in the Sun of a Peter May, the “boss” of a car clamping company. 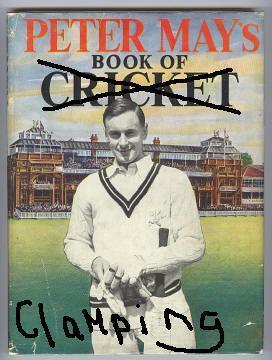 Peter May is ever the right-handed England XI bat who made his Test match debut against the South Africans at Headingley in 1951, scoring 138, was Wisden Cricketer of the Year in 1952 and went upstairs to become Chairman of the England cricket selectors. Had he not died in 1994, Anorak would be interested to learn the route than led to him clamping cars in the West Country. To the scene, and Andrew Firetto, owner of an Italian eatery in Bristol, has been given a parking ticket by Shannon Sellick and her boss, the aforesaid Peter May. Mr Firetto is not happy. The clampers say he makes throat-slitting gestures. The clampers drive away… with Firetto spread eagled on the bonnet of their van. Mr Firetto tells Bristol Crown Court that he was driven for 150 yards through the city streets. He was in fear of his life. Mr May, who always played with a straight bat, says he feared for his own life.